Finish Place (Age Division & Overall): ??/?? & ??/?? Mark’s Finish Place (Age Division & Overall): 4/7 & ??/?? 5k’s — a race that once you start running longer distances you tend to forget about. It seems like when you are training for a half marathon or a marathon that running a 5k literally becomes no big deal. I mean — let’s think about this — we literally run at least a 5k each and every day that we go out for a training run. Racing also isn’t as cheap as one would think it is, so paying $20-40 to run in a 5k really gets expensive after a short period of time. In order for me to run a 5k now-a-days it has to be for one of two reasons — First, I will always run a 5k with someone who is just “learning” how to run and wants to get into racing! I love doing 5k with other family members and friends who cannot go longer distances. And secondly, I will run a 5k when I truly believe and support the cause/charity the race is benefiting. This race just happen to fit both criteria this year!!!! This race is unlike any 5k race I have ever ran before — and it is a race that Mark and I will run in each and every year from now on. 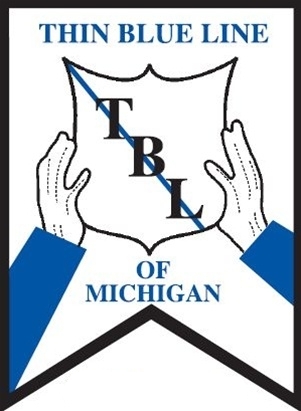 This 5k is a race that benefits the Michigan State Police Fallen Trooper Memorial Fund and The Line Blue of Michigan — two charities that are close to our hearts. 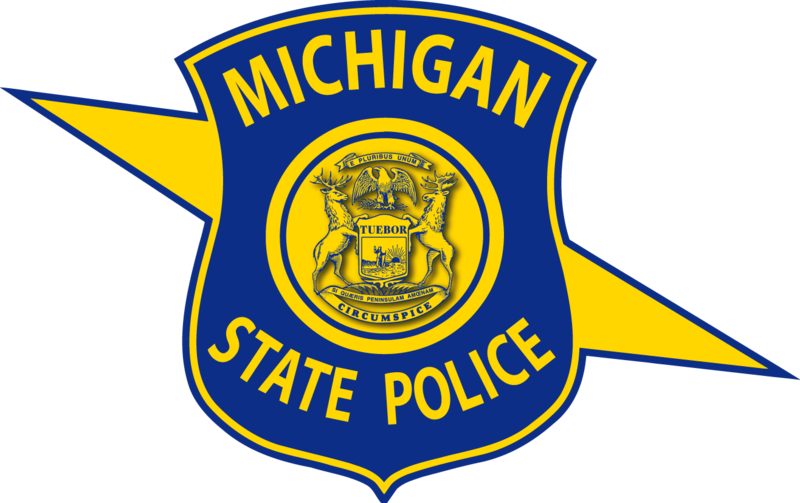 Most recently here in Michigan we recently lost the life of Michigan State Police Trooper Paul Butterfield. That made this race extremely emotional as his family was there to honor him and run with everyone. (Left) Mark and I. (Middle) Jennifer, my sister-in-law, and I. (Right) Jennifer and Mark. Before the start of the 5k race. The pre-race ceremony began with a Chaplin saying a prayer, everyone said the Pledge of Allegiance together, and then a bagpipe player played Amazing Grace. After that everyone took off for the starting line. Mark started near the front of the pack and Jennifer and I went towards the end of the pack — which has always been one of my favorite places to start a race, lol. I had such a great time running this race with Jennifer. As we walked/ran we were able to chat and enjoy each other company. All morning it had been pouring down rain; however, just before the race started the rain stopped and the weather was perfect for the race. It was not too cold, not too hot, and overall it was the perfect fall day in Michigan. Mark finished 4th in his age group — the highest group finishing spot he’s ever had. This 5k course was no easy course and is probably one of the most challenging 5k courses I’ve ever ran. Half the course is ran on a single person trail that goes up and down some pretty decent hills. Running on a wet trail course for me can be dangerous!! For those who know me know that I am not the most graceful person so once you get a wet trail course and add in rocks, large tree roots, pine cones, etc — it could really equal disaster! Luckily, I survived without injury!! 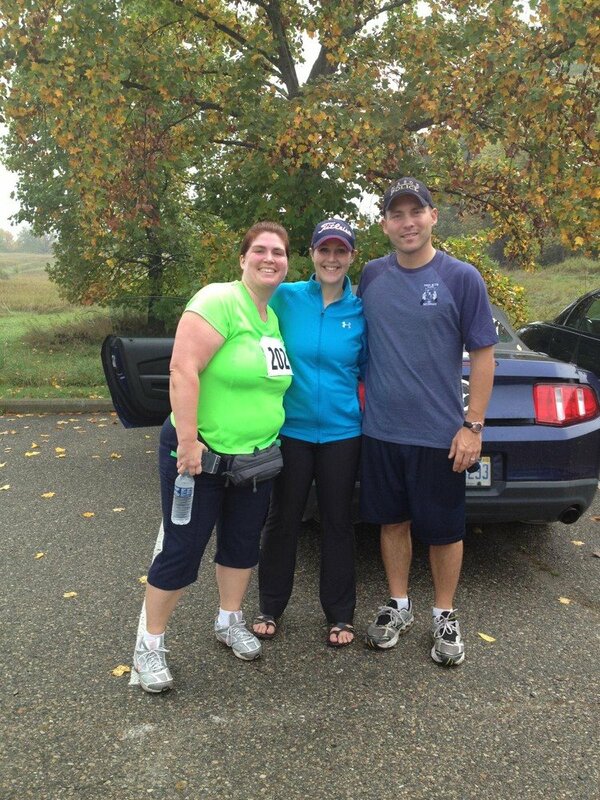 Jennifer, myself and Mark after the 5k race.